Currently in Sao Paolo, Brazil, for six shows, an extra André Rieu concert has been added to his European tour: December 8 2012 at The O2 in Dublin in addition the show on the 9th and one the next day in Belfast on the 10th. But for many people, THE big André Rieu concert will be the one at the Ziggo Dome in Amsterdam on November 30. The 60-man show includes the Johann Strauss Orchestra and many soloists grabs the maestro with his new show. Rieu promises a colourful concert full of delightful music, many surprises, balloons, The Platin Tenors and Sopranos from Brazil and South Africa. In short, the type of festive, unforgettable evening that will show why André Rieu has for years been one of the most popular live acts in the world! It’s interesting to note that Rieu is consistently successful both in his live shows and with CD sales despite the fact that his records are very rarely played on radio or TV. Rieu is continuing the tour in the UK in December, Cologne, Germany in January and Denmark in May 2013. 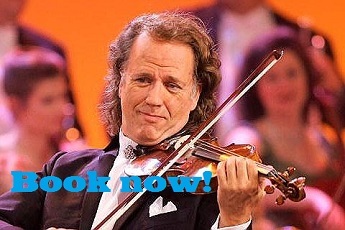 Check the André Rieu site for details. The album was recorded with the Johann Strauss Orchestra, soloists and choir, The Royal Choir Society Mastreechter Staar, The Sjamaes Children’s Choir and 10 year old ballerina Rosa. The repertoire ranges from traditional Christmas classics to emotional ballads. “Home for Christmas” will be released on October 22, 2012.